Designed as a modular solution, A-dec 300 is a whole system that lets you pick and choose the features you want, within the price point you need. And we didn’t skimp on comfort. With pressure mapped, contoured surfaces and virtual pivot back, patients are relaxed and supported. Ergonomic and economic just got better. A solid baseplate is the foundation for a sturdy chair. Along with sure footing, the A-dec 300 quietly and smoothly positions patients with a hydraulic lift cylinder that’s engineered for a 20 year life. Traditional or Continental, the choice is yours. Whether you select a dedicated left/right delivery or ambidextrous Radius®-style configuration, handpiece and ancillaries are always within natural reach. Pressure mapped, contoured surfaces and virtual pivot back ensure a relaxed and supported patient experience. Comfortably accommodates patients up to 181 kg. (400 pounds). While your patient rests comfortably, cradled in a dual-articulating headrest, your access is optimized with a slim profile and ultra-thin backrest. Engineered from years of experience, this combination encourages better positioning for you, while enhancing access to the oral cavity. Who says ultimate comfort isn’t attainable? Every patient chair, and dentist or assistant stool we design, is backed by decades of research, dialogue, tests and improvements. We never stop looking at every simple curve, smooth line and inherent contour, to make sure it delivers ultimate efficiency and comfort. Rest assured: The affordable A-dec 300 is no exception. Pedestal or Radius-style, you choose. Both options place instrumentation within reach for uninterrupted patient care. 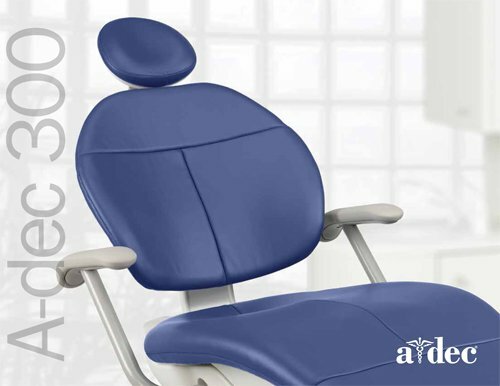 For more information on the A-dec 300: Evolved, please download the brochure below.